Far off in the Dragoon Mountains where Captain Red Beard took me to see Cochise in his stronghold, lived the chief of a band of Apache Indians, called Geronimo. His Indian name was Go-khlä-yeh, but after his first battle with the Mexicans he was called Geronimo, and the name was pronounced after the Spanish fashion, as if it began with an H instead of a G—Heronimo. When this Indian was a young man he went to Mexico to trade furs and beaded belts and moccasins for things the Indians use, and with him went his wife and many Indian men, women, and children. The Indian men made a camp near a small Mexican city and left the women and children there while they went into the town to trade, but while they were gone some white people fired at those left in camp, and when Geronimo came back all his family were dead, and everything he had was destroyed. At first Geronimo was so sad that he could not eat or sleep, and wandered about in the woods as unhappy as any one could be; then he began to be angry and wanted to fight all white men, and that is how he first made up his mind to go on the war-path. Geronimo was a very quiet man and yet he danced with the other Indians, pitched quoits with them, or played the game of poles. This is called the pole fight. The Indians draw two lines on the ground twenty steps apart; then an Indian, taking a pole ten or twelve feet long, grasps it in the middle and, swinging it from right to left over his shoulders, runs from the first to the second line and casts the pole as far in front of him as he can. Geronimo was often the winner in games, for he played very well, especially a game called "Kah." This is always played at night and a great fire gives light for it. Sides are chosen with four on a side; one side they call beasts, the other side birds. An old blanket or piece of canvas is propped up between the beasts and birds and on each side they dig four holes and put a moccasin in each hole. Then one of the birds is chosen by lot and while all the birds sing he hides a small piece of white bone in one of the moccasins. The beasts have clubs, and when the blanket is suddenly pulled away one of them points with his club to the hole where he thinks the bone is. If he is right his side is given a stick from a bundle like jackstraws held by an umpire. Those who win become birds and hide the bone. If they lose they remain beasts. When the jackstraws are all gone the game is over, and the side with most sticks wins. Geronimo played games and danced, but all the time his mind was on war and he did not love his white brothers, so he lived in the mountains and planned battles. Often he had for his house a short, scrubby tree with a hollow in the ground near its trunk. Here he spread a deer-skin for his bed and some woolen blankets on a large stone close by for a seat. 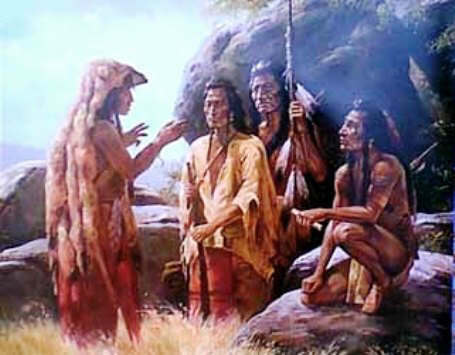 I am sure the friendly red men in the "Never, never, never Land," where Peter Pan lives, must have been Apache Indians, and that Peter Pan and the other boys learned from them to live in hollow trees. Perhaps Geronimo may have known Peter Pan, only I suppose he called him by some Indian name of his own. At any rate, this Indian Chief lived very often in hollow trees, and liked that sort of a home very much. Geronimo was one of the Indian captains who was with Cochise when he decided that the Great Spirit wanted the Indians to make peace with the white men and eat bread with them. At that time most of the Indians were very happy to have peace, and Geronimo seemed quite as pleased as the others, though I believe he was not yet quite sure that it was time for peace to come. At any rate the great Cochise said it was, so Geronimo was ready to ride with us to meet the soldiers, and, as I was willing, he sprang up over my horse's tail and by a second spring came forward, threw his arms around me and so rode many miles on my horse. During that ride we became friends and I think Geronimo trusted me, although he trembled very much when we came in sight of the soldiers near Camp Bowie. Most of the Apache Indians kept peace fairly well after that, but the white people and Mexicans were not good to them, and Geronimo did not love his white brothers, so he was on the war-path again before long. Then Uncle Sam sent one of his officers to fight against Geronimo and his Indians, and they were made prisoners of war and taken far away from Arizona to the Mount Vernon Barracks in Alabama. Here they were fed and clothed and guarded. Their children were sent to school and they were all treated kindly, but they were prisoners and could not go away. In 1889 I went to Mount Vernon Barracks, and the first man I saw as I got out of the train was Geronimo. He had a bundle of canes of different sorts of wood, which he had peeled and painted and was selling them one by one. When he caught sight of me he passed his canes to another Indian and ran to meet me. I could not understand his Apache, but he embraced me twice and called his Mexican name, "Geronimo," "Geronimo," many times so that I should be sure to know who he was. Then he got an interpreter and came to talk with me. "I am a school superintendent now," he said. "We have fine lady teachers. All the children go to their school. I make them. I want them to be white children." From among the Indians at Mount Vernon Barracks there were formed two companies of soldiers, each of fifty Indians. Geronimo was very proud of them and kept saying, "Heap big! Tatâh; heap good!" and he told them to do their best to keep their uniforms bright and clean, to make their gun-barrels shine and never have dust on their shoes. But though Geronimo tried his best to be happy and contented, he was homesick for Arizona and begged me to speak to the President for him. "Indians sick here," he said, "air bad and water bad." I told him that there would be no peace in Arizona if the Indians went back to the Chiricahua Mountains, for the Great Father at Washington could not control the Mexicans and white people there and make them do what was right; and Geronimo tried to understand. He still helped the teachers and stayed, himself, much of the time with the children to help keep order, but though he was doing his best to make his own people better, still he did not love his white brothers. Geronimo was taken to the Omaha and Buffalo Expositions, but he was sullen and quiet, and took no interest in anything. Then at last all the Apache Indians were sent west again to the Indian Territory near Fort Sill, Oklahoma Territory, and here Geronimo began to go to church and became a Christian Indian. The last time I saw him he was at the St. Louis Exposition with the "Wild West Show." He stayed in St. Louis for several months, for people wanted to see him as much as they did the Filipinos from Manila, the Boers from South Africa, or the Eskimos from Alaska, and hardly any one went away without asking to see Geronimo, the great Apache war chief. His photographs were in great demand, and he had learned to write his name, so he sold his autographs and made a good deal of money. He wanted to see other Indians, too, especially Indians who were not Apaches. He was very much interested in other people from all over the world, the strange things that showmen did, the animals he had never seen before—bears from the icy north, elephants from Africa, learned horses, and other things new and strange. Nothing escaped him, and everything he saw was full of interest to him. Since he had become a Christian he was trying to understand our civilization and, at last, after many years, Geronimo, the last Apache chief, was happy and joyful, for he had learned to try and be good to everybody and to love his white brothers. This story of Geronimo is featured in the book entitled Famous Indian Chiefs I have Known, by General Oliver Otis Howard, New York, NY, The Century Co. 1916 that was first published in 1908.